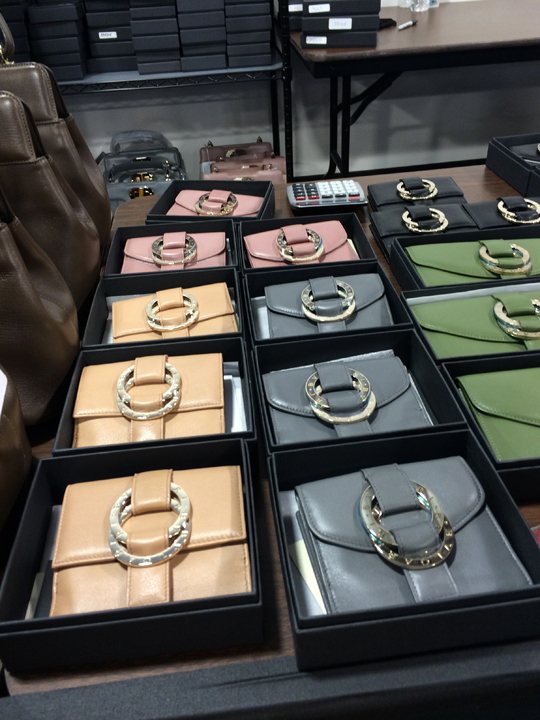 Italian jewelry and luxury goods maker Bulgari made its return to the sample sale scene today. 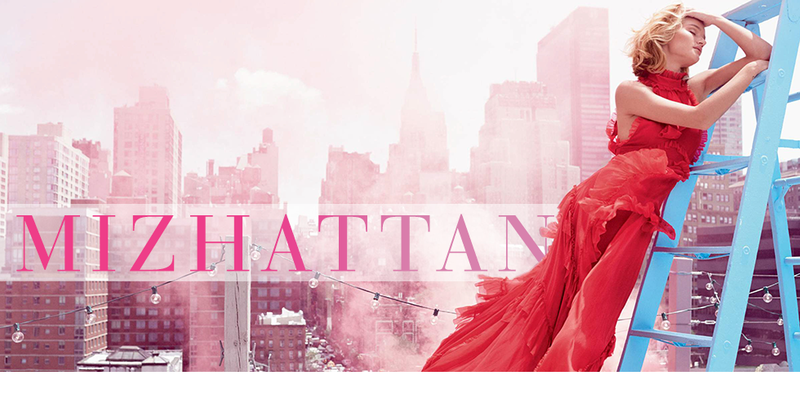 Though the brand has been continuously hosting its bi-annual bargain sales in NYC, I haven't had a chance to check out their event in ages. Therefore, I decided to pay a visit this morning and see what kind of deals I could score. 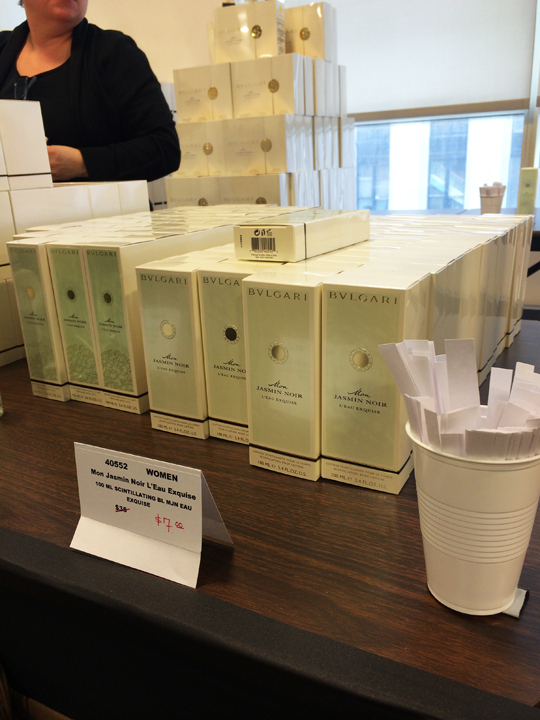 When I arrived at the sale, there was already a long queue of Bulgari fans eagerly waiting. By the time the sale opened at 9am, there were well over 90 people in line. 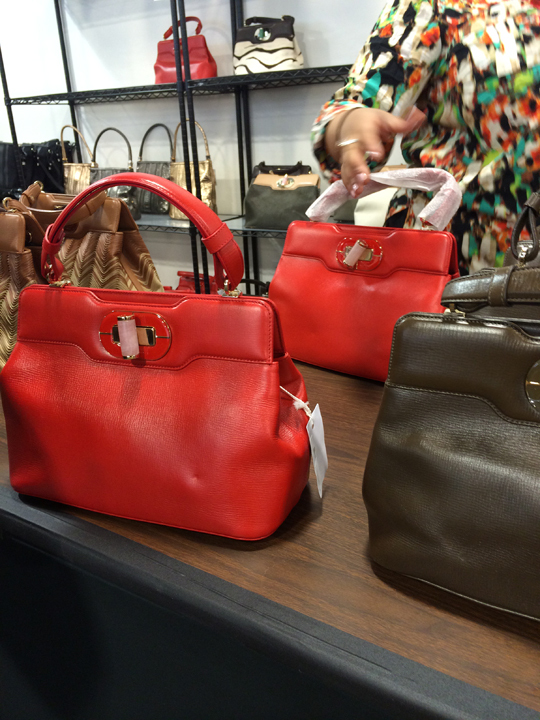 So, with great anticipation, I made my way into the showroom with the first group of shoppers. First thing to mention, there were no men's ties. I've been told by many sale goers that silk ties are one of the highlights of Bulgari sample sales. Unfortunately, you won't find them at this week's event. 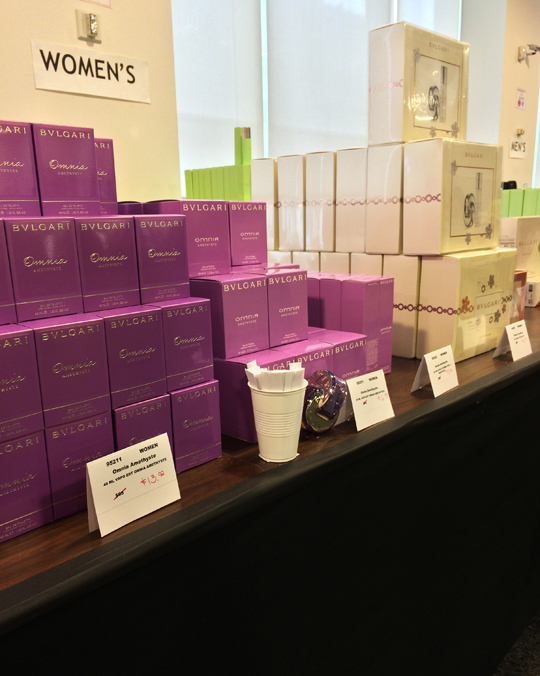 Instead, there was a wide assortment of fragrances for women and men. 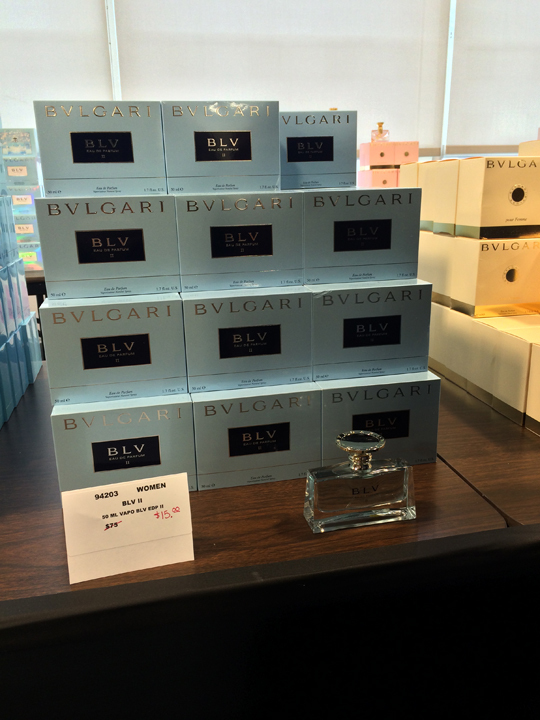 For ladies, the sale offered BLV II, BLV pour Femme, Bulgari pour Femme, Rose Essentielle, Omnia Améthyste, Omnia Crystalline, Jasmin Noir, and Mon Jasmin Noir. 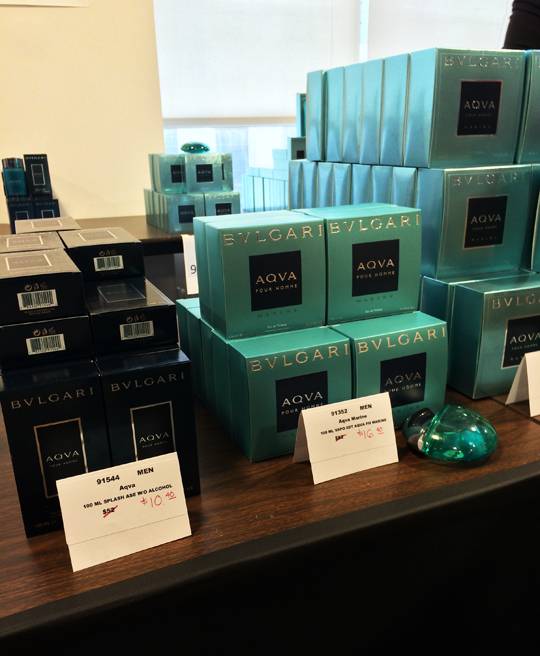 Men's fragrances were noticeably less stocked and was comprised of the AQVA line. Prices were great for both genders. For example, gift sets were $20~$48 while spray bottles were $7~$20. 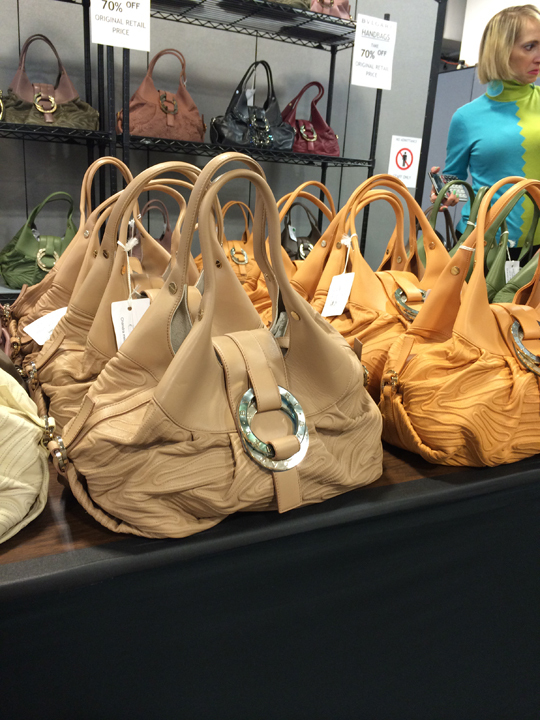 Today's sale also included handbags and wallets. I spotted several variety of Chandra as well as Isabella Rossellini. 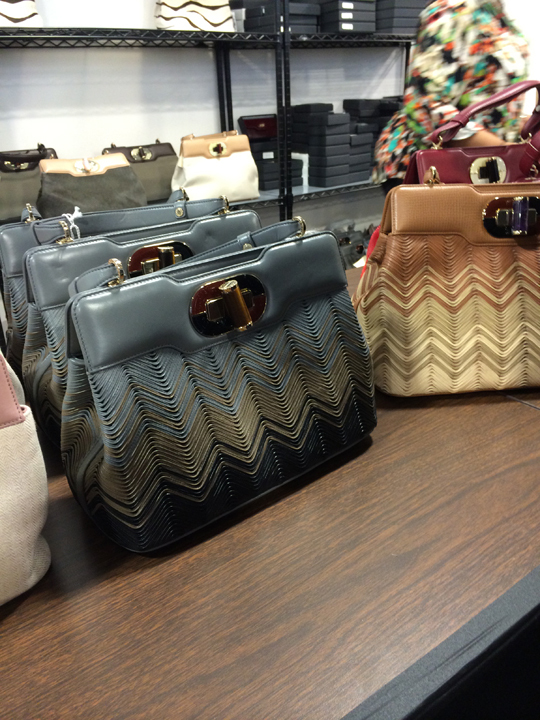 Prices on Chandra hobos ranged from $690~$900 while the Isabella Rossellini collection (available in canvas, red calf leather, chevron, and more) ranged from $615~$975. 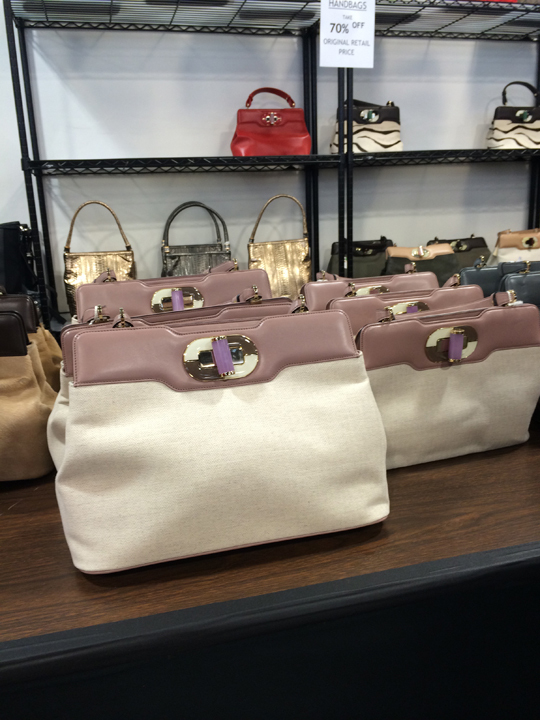 Wallets were discounted 70% and they were priced $171~$234. 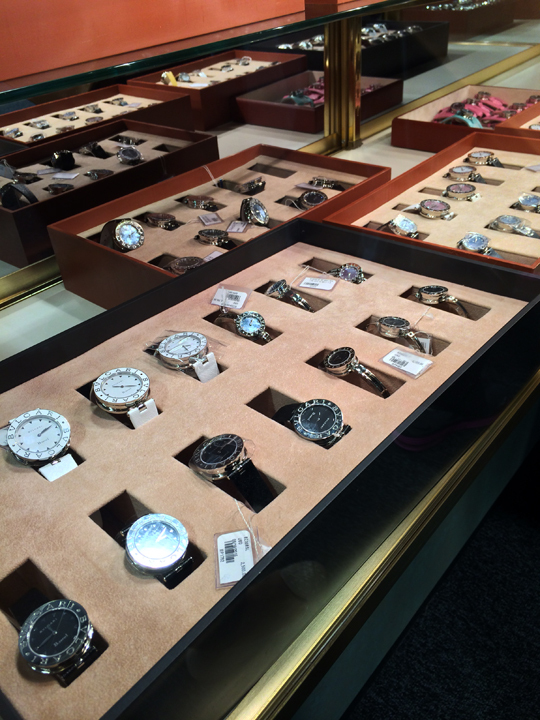 Adjacent to the leather goods were watches and jewelry. Serpentis were nowhere to be seen but Bulgari's other icon, B.Zero1, was available at a 60% discount. In addition to B.Zero1, other watches like Ergon & Assioma were marked down 70% off. 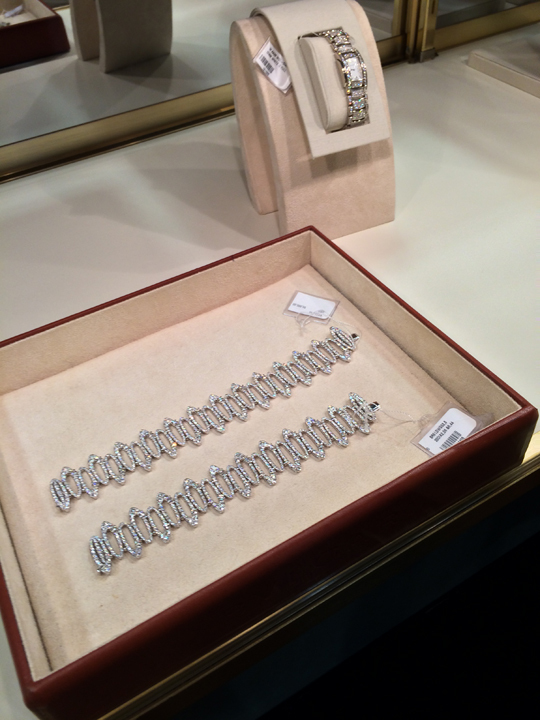 Finally, the jewelry section was gleaming with diamonds. 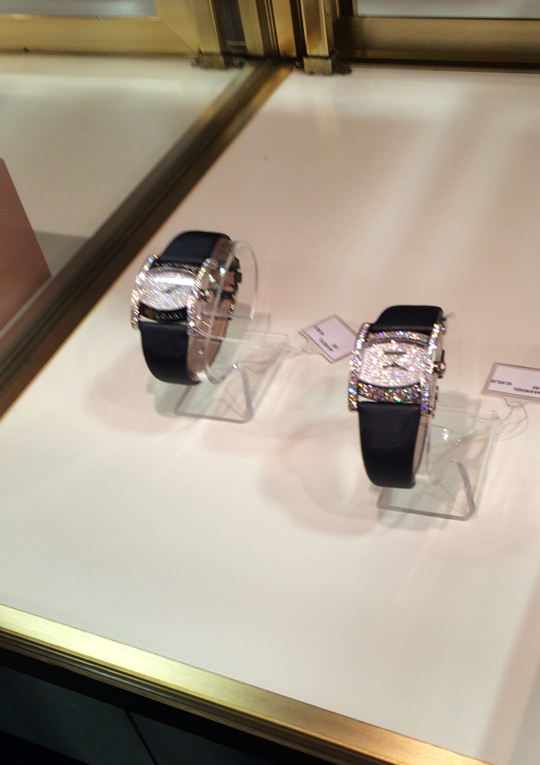 Watches, bracelets, rings, and necklaces covered in sparkly diamonds were discounted 60% off. A delicate diamond chain necklace I spotted was $14,880, while diamond encrusted Assioma watches were $13,800 & $20,400 (10th photo below). 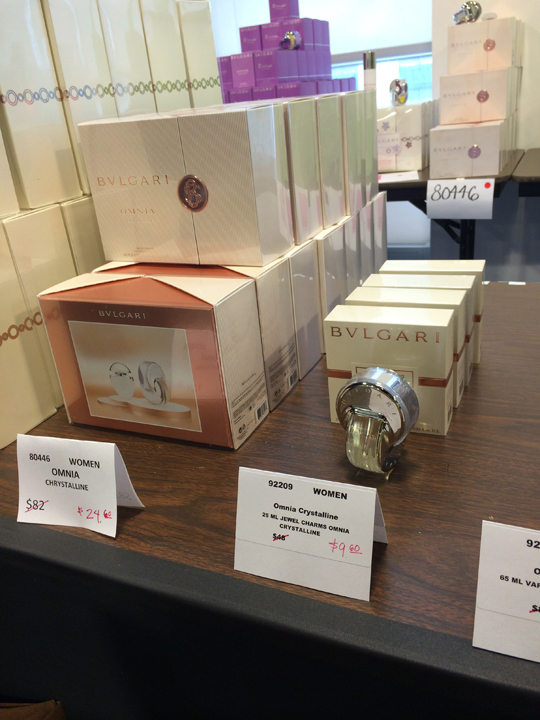 To sum up today's sale experience, the best deals were in the fragrance dept. 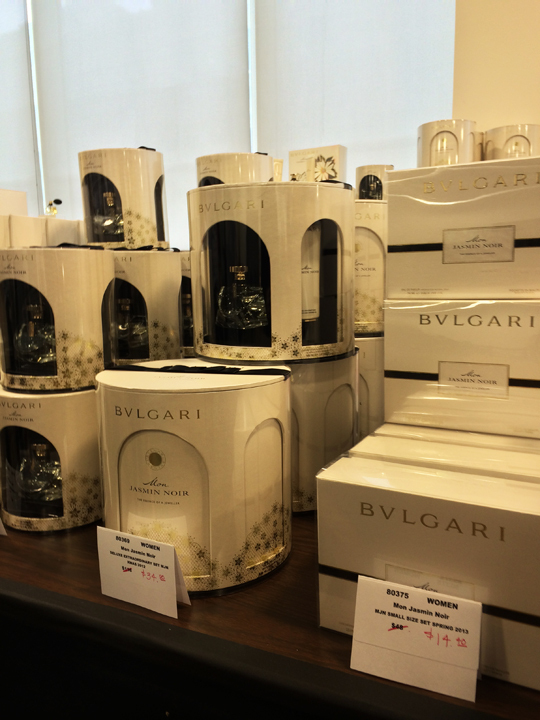 Not only were they affordable, savvy bargainistas will notice these perfumes are currently being sold at Bulgari boutiques & online store at full price. 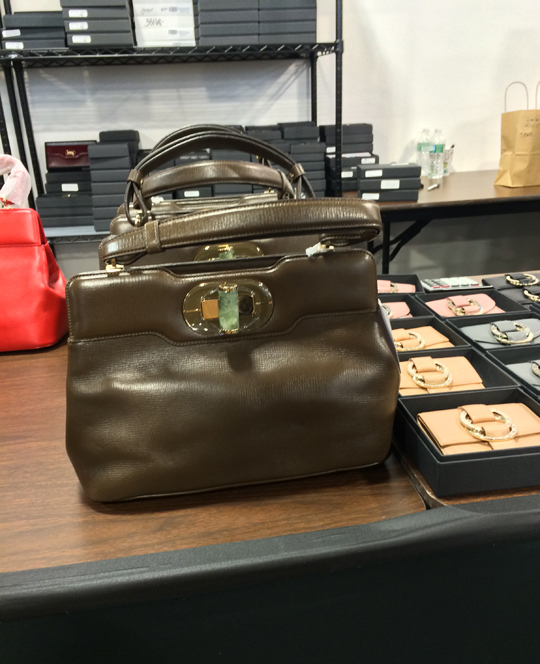 If you plan on attending, this week's Bulgari sample sale will run through Friday. Thank you so much for posting! I was eagerly waiting the fragrance and watch rundown. I am heading over there around 4:00pm and hope there is no line. do they have B zero necklace? No. There were only about 6 diamond chain necklaces. They didn't have any B.Zero1 necklaces. There was 1 tray of rings (16th photo). I was in the first batch that went in...there were no sunglasses. 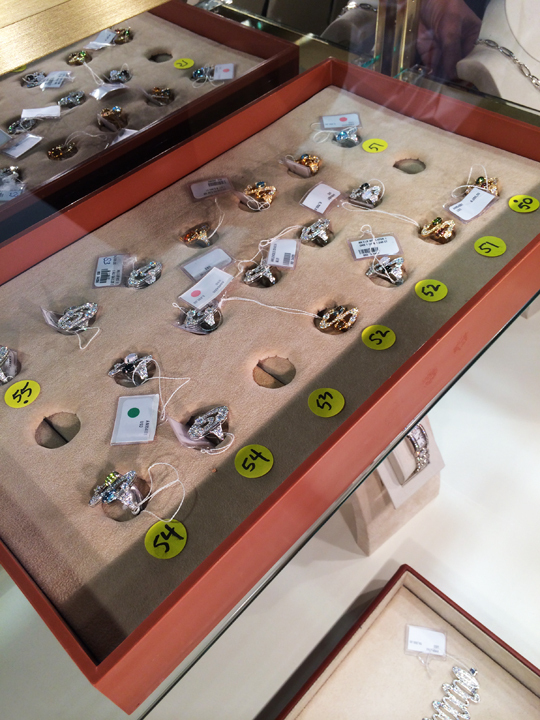 Don't remember the exact individual prices but every ring was 60% off. Hello, I wonder if it is authentic. 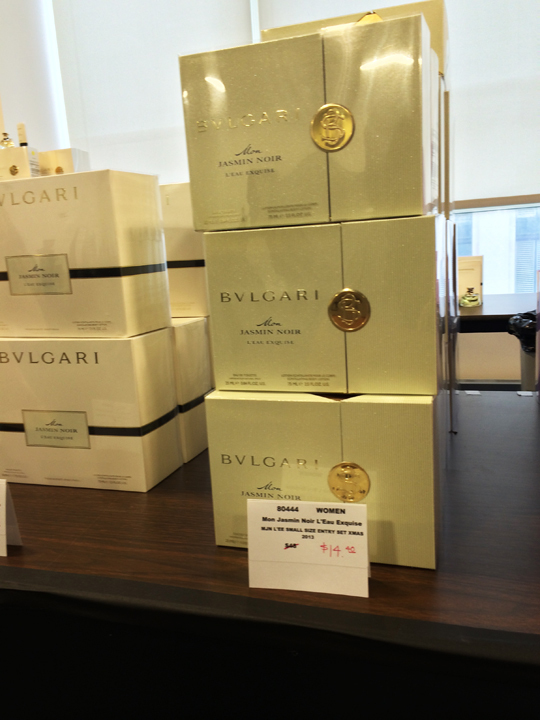 Is it hosted by Bulgari itself or is it an authorized reseller? Everything is genuine Bulgari. Soiffer has been in this business for quite a long time. I'm anon @ 1:05. I went today around 4p and so much stock was depleted. The only fragrances left for men were the Blv Toniq, lotion and aftershave. Lots of the ladies single fragrances were also sold out. 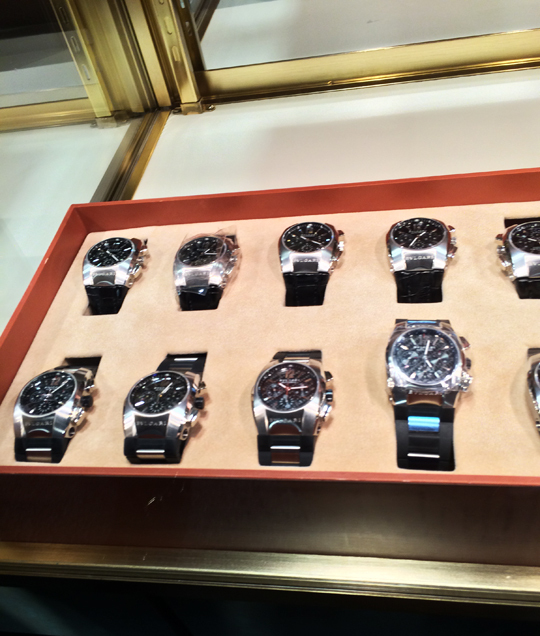 The watch selection was pretty good if you were in the market. 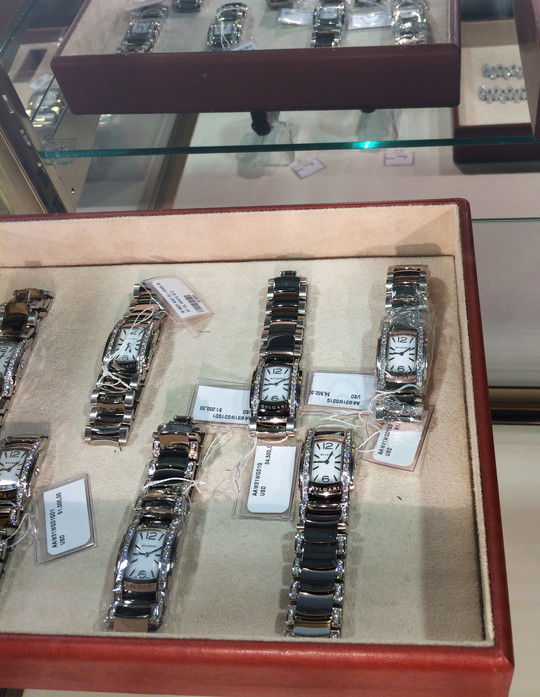 These were some of the best prices I've seen for B watches even though almost all are discontinued. I asked almost everyone there about restocking and the general consensus was "no". 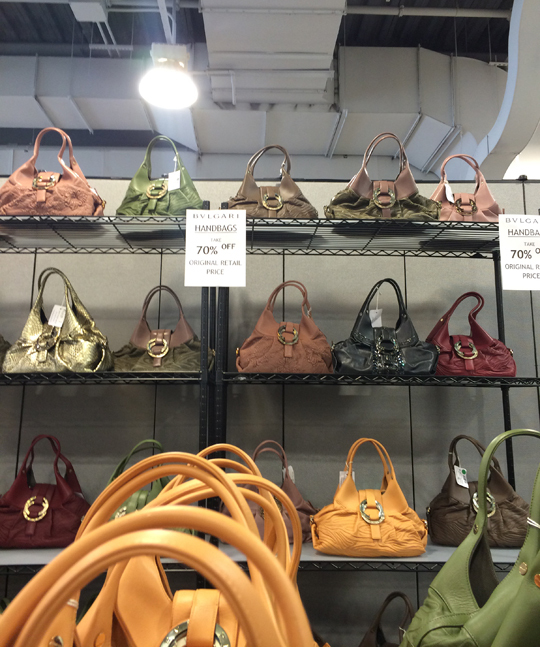 I've never been to this sample sale before so does anyone know if there will be a restock? The fragrance prices were really great deals. Thank you as always, Mizhattan for posting such comprehensive reviews. I should be thanking you for such a in-depth review! Even though much of the stock was gone, I hope you still found what you wanted. Thank you again for your comment and for reading!! Were there any men's wallets? I don't think there were men's wallets. Do you think its busy at noon? Yes, they only accept credit cards. No, I don't think it will be crowded today. No line this morning. Still a lot of perfume left but pricier. 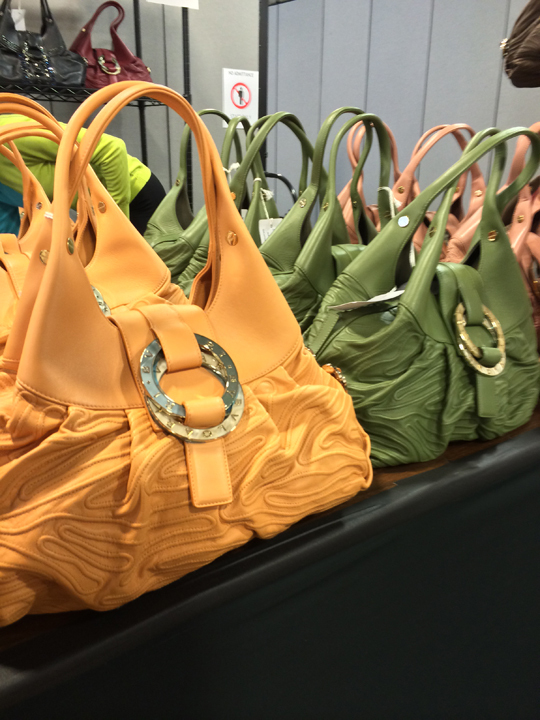 The under $30 gift sets and the under $10 single EDTs in Mizhattan's report are all gone. 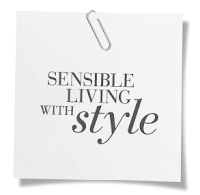 -Rose Essentielle EDT 25mL, they raised prices from $9 - $14.40! Your little angel is right here! Yes! There are watches left! Basically, they are same in the first photo. B zero 1 is the cutest they have (my opinion). There are bunches of B01. Black, white,etc. B01 No. BZ30BSL, is from $2500 to $920, which is 60% off. If you really like it, it's a good chance to get it. I bought 5 perfume gift sets! Thank you for your reporting! 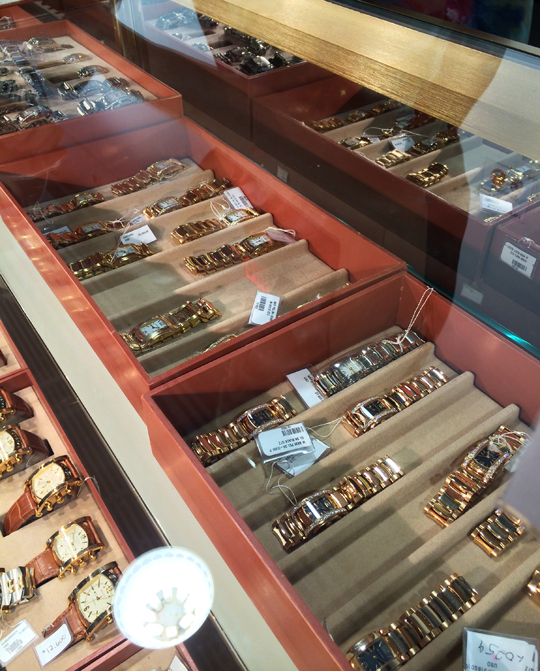 How much off men's watches? Did they have men's belts or cufflinks? Thank you Miz for your detailed report. You are always great! 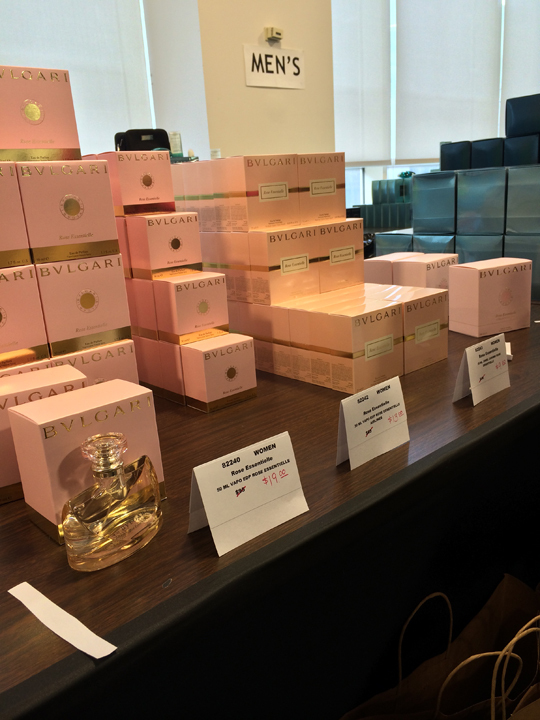 I was there at 11am on the first day and sadly to say, there were 3 women (with 3 men as their helpers) that swept up most of the perfume/cologne stock for resale. The Bulgari staff actually set up a separate table for them in the middle of the showroom floor to pack all of their stuff. Most perfumes pictures in your review were gone by the time I entered. I guess the early bird gets the worm. The prices were ridiculously cheap. They were practically giving the stuff away (perfume-wise). Thank you for commenting and letting us know how things went while you were there. Hope you were able to grab something nice! Yes, I grabbed a couple of perfumed lotions and perfumes. Just wish I got there before the re-sellers got to the place so that I would have had a chance at one of the perfumes that were gone when I was there. Any discounts for the last day? What is left in the perfumes? I got an email about reductions today, if anyone goes please post details about what was reduced. Thanks! And thanks Miz for the great blog. I'm sure they mean the reductions were for handbags only. any further reduction for watches? I had tried posting this from my iPad last night but I don't think it went through. I went on Monday around 4 (the people Alexandra posted about were still there!) and there was still a lot of stock at great prices. When I got home I realized that 2 of the items that I thought I purchased were not in my bag or on my receipt, so I wanted to go back. I went yesterday after finding out that they restocked, but was utterly disappointed. They only restocked men's items from what I saw, and more importantly increased all of the fragrance prices. When I asked why, I was told that they calculated the discounts incorrectly on the first day. Thank you for your insight! I highly doubt it was an error in calculation. Most probably they saw how people were clamoring and saw an opportunity. Fragrance prices were actually raised across the board except for the Jasmin Noir gift sets. The smaller 3 piece ones are now $19.60 each but stock is going fast as there are swarms of resellers in there. This is one - http://www.ebay.com/itm/BVLGARI-SET-JASMIN-NOIR-PARFUM-10-50ml0-34-1-7-fl-oz-SHOWER-GEL-75ml-2-5-fl-oz-/181389865098?pt=fragrance&hash=item2a3badb08a. This is the other - http://www.ebay.com/itm/BVLGARI-JASMIN-NOIR-by-Bvlgari-3-Pc-Gift-Set-for-WOMEN-NWB-/321362259131?pt=fragrance&hash=item4ad2aeecbb. Not my auctions. I just used them for reference. There are pairs of people purchasing 20-30 boxes at a time. No more Omnia except in the Charms set which I did not see on Tuesday. No more Rose Essentialle either. Really the only ladies fragrances left are the Jasmon Noirs and body lotion in Eau Vert but these were being snatched up too. There was a restock on men's fragrances. I was able to get Pour Homme and Aqua Pour Homme for $24.60 each for the 3.4 ounce. Watch prices are still the same. I believe a few were discounted by another 10% but they are all gone. Much appreciate the in-depth details! They are basically 50% off. I think the wallets were going to be discounted another 10% as well but I left at 11:00 and no markdowns had taken place yet. I only recall seeing two black ones in the display. 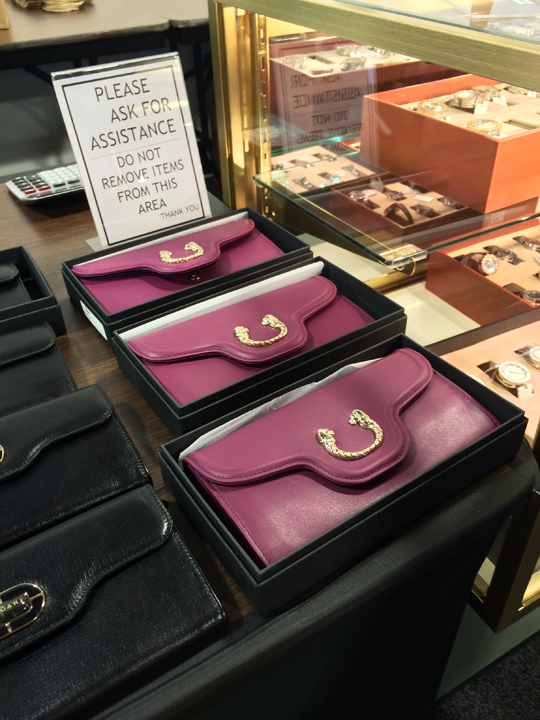 Just clarifying - there were other wallets but out of the black ones, I only saw two displayed.